I want to go out. I want to go out. I wanttogoout.4.5 stars. Holy _____ . You can choose which word to insert there but you might want to pick something much stronger than cow. Because the word I'm thinking is pretty strong with a lot of caps and exclamation points following it.People (ahhh...yes, the very abstract and almost imaginary use of "people") have been telling me to read this short for a while now. I should have been listening sooner. Btw... 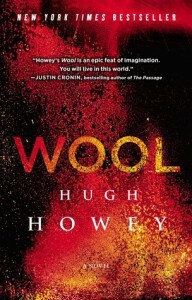 Wool is a very condensed little read. It only took me about a half hour to get through the entire thing. It's worth the try (especially if you like dystopia) because there's no risk when something is this short. I'm tempted to jump right into Wool 2 but I can't right now.Imagine being trapped in a silo, the rest of the outside world a complete mystery to you. Information is limited as to what's going on "out there." Your wife went crazy trying to figure it out. You feel like you're going crazy trying to know yourself.Allison whispered something almost inaudible : "It's not real. Nothing you see is real. "Holston turned back to survey the muddy, lifeless landscape. It only looked depressing compared to scenes from the children's books. "You okay?" Nelson asked. "Anything too tight?" Holston glanced around the airlock. My life is too tight, he wanted to say. My skin is too tight. The walls are too tight.The animal part of his mind wasn't made for this, to be calmly ushered to a death it was perfectly aware of.Yep. A lot happened in the span of a few pages. There is so much packed into such a little short. The ending was crazy. I honestly have no idea what's going to come next, so I'm very excited to get to the next installment as soon as possible!